One of the best things about any book festival, especially the astonishing clanjamfrie that is the Edinburgh International Book Festival, is the discovery of new authors. By this I don’t mean only those authors new to the craft, but those long-established writers you have somehow neglected up until now. Cleverly, Edinburgh frequently pairs authors in its events – not only does this appeal to the Scottish psyche (two for the price of one!) but it allows you see an author you love… and an author you might love. And so it is that my enjoyment of Manuel Rivas brings me rather strangely (but wonderfully) to Ron Rash. 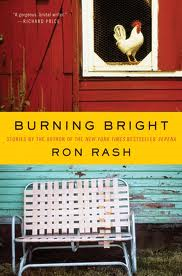 Rash is an American writer who already has five novels under his belt as well as a number of short story collections, and it was with one of these I started: Burning Bright, originally published in 2010 and appearing here a year later thanks to Canongate Books. The image of the crashed plane where he finds the ring (see I told you it was ironic) is central to his dreams of a better life. Ultimately, living with it is about the best Rash’s characters can hope for. But while they are generally not to be admired, neither do they feel pitied. Rash’ writing gives eloquence to the lives of the inarticulate, the marginalised and the forgotten. Despite their often grim subject matter it is difficult to describe these stories as anything other than beautiful. You are currently browsing the archives for the Ron Rash category.